We spend a large part of the day away from home during the week. We look forward to the arrival of the weekend to disconnect and, why not, do some repair at home. Sometimes they will be botched that you can do yourself, without having to go to a specialized technician. Therefore, we want to show you what tools you should have at home to deal with these unforeseen events. Fix a door handle, tighten some screw that has been loosened over time, hang pictures or measure some furniture ... They are things that we have all done or will ever do. That is why it is so important to have a toolbox with the essential equipment to tackle any domestic fudge. 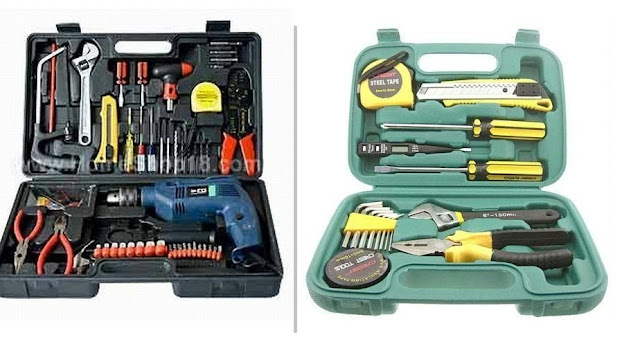 Well, without further ado we present you with a list of tools you should have at home. First, you should always have a screwdriver at hand. There are many types although for the home you will only need the most common, the plane and the star. They are inexpensive and economical tools to which you will give safe use. You always have to tighten a screw sooner or later ... If you go a step further and you are passionate about DIY, surely you would have talked about battery screwdrivers. These, they are more comfortable since you will do much less strength and durables. Another essential tool that you must have at home is a hammer. There will be the typical phrase "a nail brings out another nail", right? There are a variety of hammers in the market, each one has its own characteristics. This tool, necessary to nail and remove nails, belongs to the group of tools that have to be part of your personal toolbox. Depending on the use that you are going to give the hammer, you can choose the one that best suits your needs. Have you ever thought how can you tighten the nuts so much? Sometimes we want to loosen the nuts with our hands as if we were the incredible hulk, and it is impossible for us. Well, always have a good spanner in your toolbox. The importance of ratcheting wrenchis vast and it is one of the most essential tools to have in our collection. When you least expect it, you have to take action on the matter. This tool is very useful for making measurements anywhere in your house. In addition to using it in repairs or homemade junk, you can give it many other applications in your daily life. Did you know that the word pliers comes from Arabic? This tool is essential to hold different pieces or objects or to mold some materials. It is essential for any work of DIY and is really vital in any type of electrical or electronic work. If in your toolbox you already have all the utensils we have discussed, you are ready to carry out work and home repairs. With everything and with that, there are pieces and objects that we should not forget and that will be useful for the sloppiness at home. Screws, nuts, washers, hooks to hang your favorite pictures are some of the necessary items to have in your toolbox at home.